Star Trek or Planet of the Apes? That was the paralyzing decision that I had to make one afternoon in 1975. I stood transfixed before brightly colored boxes, my brow furrowed with the anxious knowledge that whichever option I chose, it would come at the expense of forfeiting the other. Star Trek or Planet of the Apes? Both playsets looked fantastically inviting, especially when accessorized with a quartet of eight-inch action figures. I studied the pictures and tried to envision what exciting scenarios I might be able to create with these tantalizing toys. Did one of the choices offer more hours of fun? Might I grow tired of one of them sooner than I imagined? Did one road lead to sustained happiness, while the other ended in unforeseen regret? My nostrils flared. Star Trek or Planet of the Apes? My mother and father stood nearby, patiently observing their youngest child’s angst. We were standing in a long aisle within the vast establishment known as Children’s Palace. The mere sight of its turreted facade had thrilled me to my very capacity for excitement, for I had seen television ads for the store and yearned to visit it like a prospector dreams of El Dorado. In my hometown of Lima, toys were confined to a small department within stores that sold an array of goods. The concept of a big box retailer dealing exclusively in toys was like hearing tell of a swimming pool filled with chocolate milk. Yet here in Columbus, I was standing within a genuine Children’s Palace. Children of today have no point of reference to comprehend this wonderland. A modern simulacrum would be Toys ‘R’ Us, yet its wares lack the charm of a Children’s Palace at the dawn of the disco era. In 1975, toy store stock did not include endless titles for rival video game systems, nor did glossy boxes concealing computer software line the shelves. All of the items for sale offered a tactile experience, and to see row after row of board games and bikes and models and Hot Wheels and Rock ‘Em Sock ‘Em Robots and many gizmos hitherto unseen was overwhelming in the most euphoric way. Not to mention dolls, Barbies, and all things pink, if you liked that kind of thing. It was like a preview of heaven. Both of the items I coveted were manufactured by Mego, the same firm that would later unleash Captain and Tennile and KISS action figures upon a jaded public awash in the peculiar trends of the Seventies. The outfit would have made Eli Whitney proud, minimizing production costs by sticking different heads onto interchangeable articulated bodies. Apparently in some cases, overstocked heads for unpopular lines were reused for later products. According to collector Michael Rogers, that is how the Paul Stanley figure came to be topped with the painted noggin of Daryl “Captain” Dragon. One can only wonder what happened to the heads of Toni Tennile. In hindsight, the most amusing thing about my childhood dilemma is the fact that I am not, nor have I ever been, a Trekkie, a Trekker, or whatever it is that devotees of the U.S.S. Enterprise like to call themselves. Neither can I lay claim to any enthusiasm beyond casual amusement for the Planet of the Apes franchise. Yet the merchandise beckoned to me with all the persuasive power of brand name recognition. At a list price of about $15 for either option (no small sum in ’75), I had to choose carefully. I considered the “Planet of the Apes” Treehouse. A little spare in design, but it included a barred cage in which to detain prisoners, which looked like fun. The open architecture offered plenty of opportunities for violent confrontations that would end with a character plunging to his death, which also sounded fun. A hatch in the roof provided further possibilities for high-altitude hijinks. 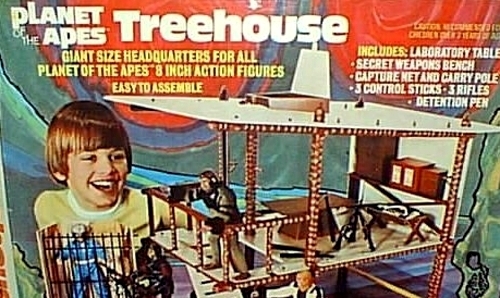 But the coolest thing about the playset was that it was meant to be inhabited by Planet of the Apes action figures. There is something fundamentally irresistible about talking simians wearing bandoliers and brandishing rifles. Really, who wouldn’t enjoy owning a set of eight-inch, articulated apes? The Star Trek action figures, on the other hand, were far less interesting, though the resemblance to their TV counterparts was impressive. The U.S.S. Enterprise Action Playset was a vinyl-sheathed hexagonal box that opened to reveal a rather crudely interpreted bridge set. Minimally detailed furnishings included a bulky captain’s chair, a pair of stools that looked more like snack tables for the captain, and a boxy object with symbol-laden decals that was meant to represent a complex control console. A slot behind the viewscreen was intended to receive any of a dozen cardboard inserts featuring illustrated scenes of mediocre quality. Overall, it was a less enticing package. But…it had one redeeming quality that I found absolutely fascinating. A rectangular box housing a rotating cylinder represented the famous transporter room. Like a closet with its door removed, the space was enclosed on three sides. The cylinder had a panel of its exterior cut away, allowing one to place an action figure inside a quarter of the interior. Opposite this was an identical compartment. The outer surface of this container was plastered with dazzling, black and yellow, op-art stickers. Atop the whole affair were three buttons. By setting the cylinder spinning with the center button, you would perceive what appeared to be an electrical pattern superimposed over the action figure. The other buttons stopped the cylinder cold at either the occupied or empty compartment, enabling a convincing illusion of disappearance. It was a great little magic trick, and I could not resist it. Only eBay knows what price I might have commanded one day had I kept my U.S.S. 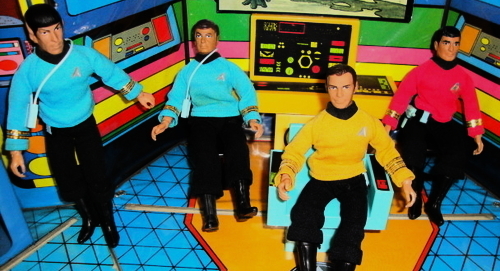 Enterprise Action Playset and my Kirk, Bones, Spock and Klingon figures in decent condition. As it was, I handled them roughly, popping off the characters’ heads and extracting the rotating cylinder from its transformer room housing for closer inspection. I lost the guns and the utility belts among the assorted detritus of my toy drawers. Even if I could have located all of the various components, it would have taken some effort to restore everything to collectible condition. I guess I just didn’t have a sufficient amount of respect for the Star Trek crew. All these years later, I am older and wiser. In my maturity, I realize the decision I should have made. Keep the U.S.S. Enterprise, but man the spacecraft with Dr. Zeus and the rest of the denizens of Planet of the Apes. Now that would have been cool.